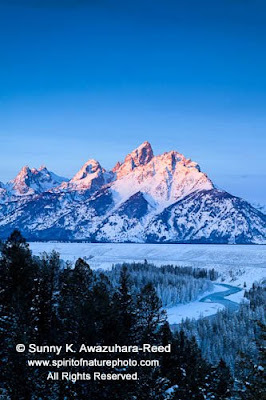 Alpenglow on the Tetons is one of the most beautiful scenes you can imagine. 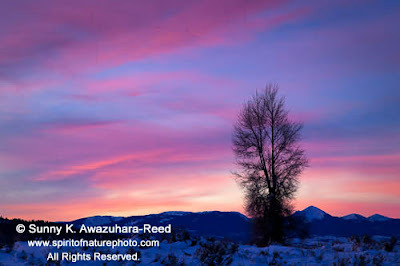 When it’s clear (preferably a few clouds around the peaks), the first pink light hits the tips of the peaks… then gradually widens across the whole mountain range. As the morning progresses, the rose color began to fade, and the sun’s rays light up the whole mountain. 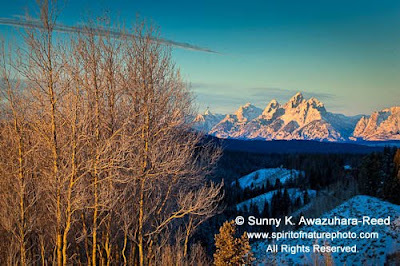 One of my favorite views is the Tetons from the pass where I live at this moment. One cold morning before sunrise, 20 degrees below zero, I set up my camera at my favorite spot, and waited until the sun came out… it took for 20 min, My fingers began to stiffen despite my warm gloves; my toes began to tingle with pain despite my heavy boots, and my cheeks lost sensation… Finally, the sun came out and lit up the distant peaks. As the sun rose, warm golden lights brighten the aspens on the hill. The Tetons were already in full of sun. The snow crystals sparkled on the intricate grasses! Another day, I was setting up at the famous “Snake River Overlook;” the eastern sky was turning vivid red right before sunrise! I turned around, and shot the most amazing colors in the sky. 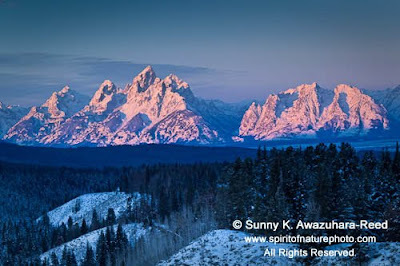 Then, I turned to face the Tetons again… The glow on the mountains was stunning, but merely ordinarily beautiful compared with the other side of the sky. Sometimes, we find something better than what we looked for. 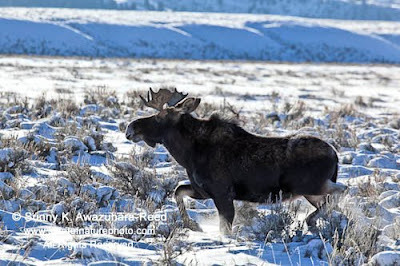 On the way back, a bull moose cross the road right behind me.